← How to rotate the page when converting EMF to GIF? How to convert MS Office Word documents of doc to pbm? A new document converter will appear in the conversion of doc to pbm or docx to pbm, which is named docPrint. docPrint is one part of docPrint Document Converter Professional which is also called docPrint Pro for short. docPrint Pro is a software product that dynamically converts MS Office 97/2000/XP/2003/2007, WordPerfect, AutoCAD DWG, PostScript, Adobe Acrobat PDF and many other document types to Adobe Acrobat PDF, PostScript, EPS, XPS, PCL, JPEG, TIFF, PNG, PCX, EMF, WMF, GIF, TGA, PIC, PCD and BMP etc formats. With docPrint Document Converter Professional you can convert your documents from and to 50+ formats easily. Two other applications are available in docPrint Pro. They are GUI application which is good at batch conversion and command line application which can be called in cmd program. 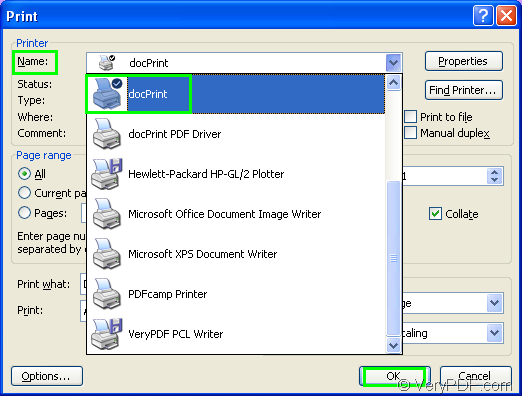 docPrint is not only a windows printer which saves ink, paper and time by controlling printed output, it supports print 2, 4, 6, 8 or 16 pages on a single sheet of paper, it is also a document converter, it converts any printable document to 50+ graphics, it may be a Microsoft Word file, Adobe PDF file, HTML file, Excel file and others, docPrint supports various image formats, resolutions and compressions. The conversion of doc to pbm can be started from now on. The printer driver should be run. You can open the word document and click “File”—“Print” to open “Print” dialog box in which you should choose “docPrint” as current printer in “Name” combo box. Then click “OK” button. Please see Figure1. You can also use the hot key “Ctrl”+ “P” to open this dialog box. Then you can see the “docPrint” dialog box showed in Figure2 comes out. In this dialog box, you should open “Save As” dialog box to set the output file. 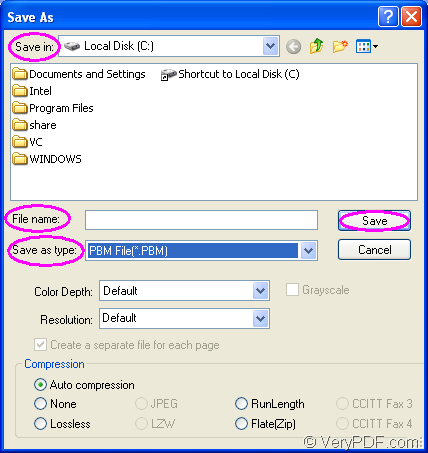 You can click “File” – “Save as” to open “Save As” dialog box. You can also use the icon in the toolbar. The hot key “Ctrl”+ “S” is always used by many people. The “Save As” dialog box showed in Figure3 will pop up next. You can finish the whole conversion process via the following operations. You should choose a directory for the output file in “Save in” combo box. Then type the name for the output file in “File name” edit box. In “Save as type” dialog box, you should specify the format for the output file. 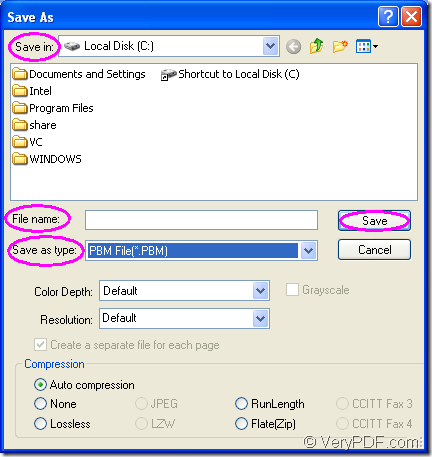 If you want to convert doc to pbm or docx to pbm, please choose “PBM File(*.PBM)”, then click “Save” button. If you don’t have docPrint on your computer, you should download docPrint Pro at http://www.verypdf.com/artprint/docprint_pro_setup.exe and install it in your computer. 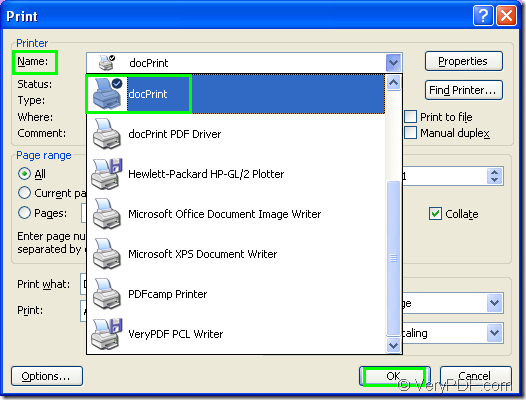 You can see docPrint in the printer list by clicking “Start”—“Printers and Faxes”. If you want to use docPrint only without the GUI application and command line application, you can download docPrint standard version at http://www.verypdf.com/artprint/docprint_setup.exe. Does your PDFPrint application work with 64-bit Windows 2008 (R1)?